When Zhu Yuanzhang, the first Emperor of the Ming Dynasty (1368-1644), captured Huizhou, a hermit named Zhu Sheng admonished him that he should built high walls, store abundant food supplies and take time to be an Emperor, so that he could fortify the city and unify the other states. After the establishment of the Ming dynasty, Zhu Yuanzhang followed his advice and began to enlarge the wall built initially during the old Tang dynasty (618 -907), creating the modern Xian City Wall. Its the most complete city wall that has survived in China, as well being one of the largest ancient military defensive systems in the world. After the extension, the wall now stands 12 meters (40 feet) tall, 12-14 meters (40-46 feet) wide at the top and 15-18 meters (50-60 feet) thick at the bottom. It covers 13.7 kilometers (8.5 miles) in length with a deep moat surrounding it. Every 120 meters, there is a rampart which extends out from the main wall. All together, there are 98 ramparts on the wall, which were built to defend against the enemy climbing up the wall. Each rampart has a sentry building, in which the soldiers could protect the entire wall without exposing themselves to the enemy. Besides, the distance between every two ramparts is just within the range of an arrow shot from either side, so that they could shoot the enemy, who wanted to attack the city, from the side. On the outer side of the city wall, there are 5948 crenellations, namely battlements. 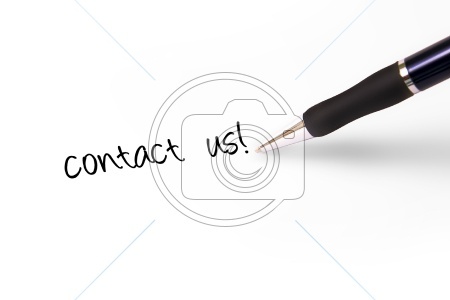 The soldiers can outlook and shoot at the enemy. On the inner side, parapets were built to protect the soldiers from falling off. Since the ancient weapons did not have the power to break through a wall and the only way for an enemy to enter the city was by attacking the gate of the city wall. This is why complicated gate structures were built within the wall. 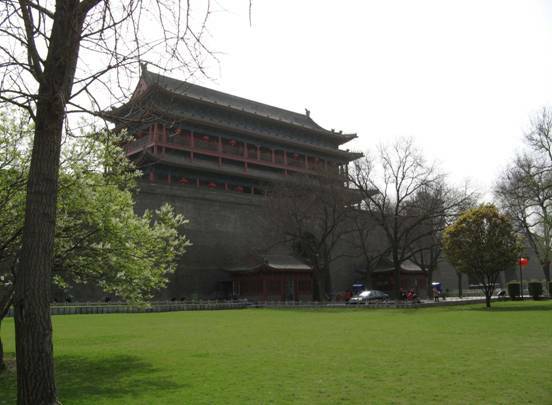 In Xian, the city wall includes four gates and they are respectively named as Changle (meaning eternal joy) in the east, Anding (harmony peace) in the west, Yongning (eternal peace) in the south and Anyuan (forever harmony) in the north. The south gate, Yongning, is the most beautifully decorated one. It is very near to the Bell Tower, center of the city. Important greeting ceremonies organized by the Provincial Government are usually held in the south gate square. Each city gate has three gate towers: Zhenglou, Jianlou and Zhalou. The most outside is Zhalou, which stands away from the City Wall and is opposite to Zhenglou. It was used to raise and lower the suspension bridge. Jianlou with small windows in the front and flanks was used as a defensive outpost. 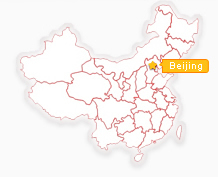 Zhenglou, in the inner, is the main entrance to the city. The wall connects Jianlou and Zhenglou Towers. The area between them within the wall was called Wong Cheng, in which the soldiers stationed. From Wong Cheng, there are sloped horse passages leading to the top of the city wall. Initially, the wall was built with layers of dirt, with the base layer including also lime and glutinous rice extract. Throughout the time Xian City Wall has been restored three times. 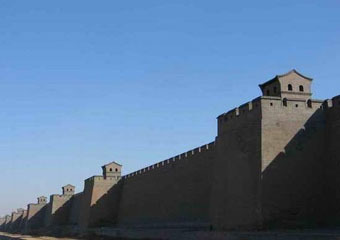 In 1568, Zhang Zhi (the government officer of that period) was in charge to rebuild the wall with bricks. In 1781, another officer, Bi Yuan, refitted the city wall and the gate towers. 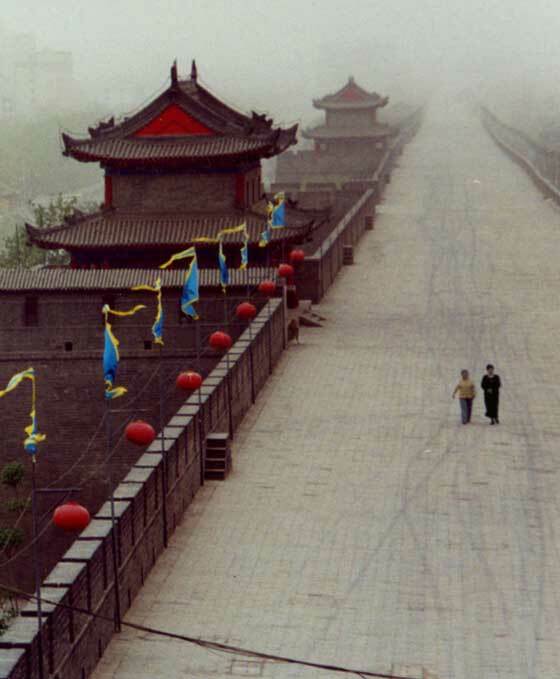 More recently (since 1983) the Shaanxi Provincial Government restored the city wall again. A circular park has been built along the high wall and the deep moat. The thriving trees and flowers decorate the classical Chinese architecture of the wall, adding additional beauty to the city of Xian.